Do you enjoy cleaning? I will be one of the first to admit that I am not someone who loves to clean and I love anything that speeds up the process. One of the things we have been doing to slowly make our house easier to clean is getting rid of all the carpet and moving to plank vinyl flooring. With two large dogs in the house, we couldn’t believe how much dirt and allergenic material carpet holds, making it a no-brainer to move away from it slowly. In our home, one of the ways we have made cleaning just about everything easier is using steamers. They disinfect using steam and are extremely easy to use, making it great for people like me who dislike cleaning, but love a clean home. Probably one of my most favorite cleaning machines is the HomeRight SteamMachine. When I heard HomeRight was coming out with a new model of their steamer, we decided it was time to retire our old one. Knowing how much we loved the previous model, HomeRight offered to send us a complimentary machine to see if we liked it as much as the previous version. What girl would say no to upgrading their favorite household tool? Homeright SteamMachine: What is It? Looking for a way to make cleaning more time efficient and more cost effective? If so, we think you will love the Homeright SteamMachine. Unlike traditional cleaners and some chemical steamers on the market, this machine does not leave any unpleasant residue since it uses one of the purest chemicals out there – water. By using pressurized steam to clean, you can disinfect just about any surface, killing 99% of all germs and bacteria commonly found in the home. All you have to do is steam the area, wipe it down, and you are done – it loosens and dissolves dirt. As well, the canister has two wheels for easy transport and has a front compartment for storing its most commonly-used attachments. In other words, it is a homeowners dream come true! To learn more, make sure to check out the SteamMachine on the HomeRight website! As someone who used the old model of the SteamMachine for years, I have to say I was pretty excited to get the new Homeright SteamMachine out of the box! For some strange reason, after the holidays, I’ve had problems keeping the house in order. As part of our spring cleaning routine, I couldn’t wait to get steaming and sanitize the house, especially the bathrooms. 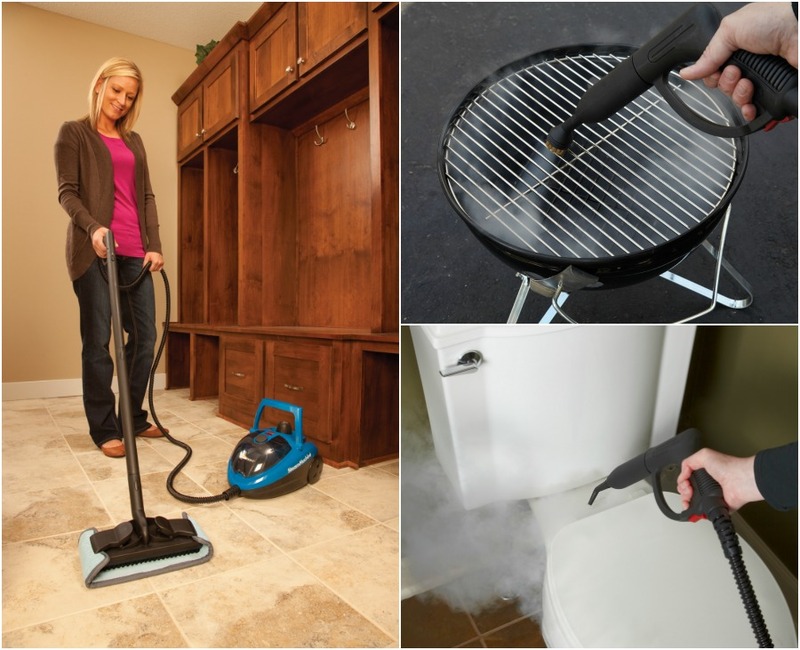 Like previous models of the SteamMachine, I love that it comes with a variety of different attachments, making it a fantastic multipurpose tool for keeping your home clean. As well, most of the attachments fit neatly in the machine, making storage easy. Really, the only thing you have to remember is to put the attachments on before you start cleaning to be safe. While every Homeright steamer I have ever used has amazing safeties, it is always better to be safe than sorry, as suggested by the manual. One of the things I have always loved about the SteamMachine is how easy it is to use. With the right attachements, it sanitizes and cleans just about any surface, cutting cleaning time in half, especially on cleaning jobs that require scrubbing. I especially love that I can ditch most cleaners since high-temperature steam kills 99% of germs and bacteria. Really, a steam cleaner is one of those things you don’t realize how much you needed until you have one. Now, I couldn’t imagine life without my steam cleaner and love that the new model is just as easy to use. As well, there are even more tools available than the original model, allowing you to do just about anything with your steamer, including safely remove wallpaper! Overall, I don’t think I could be happier with the latest version of our favorite steamer. Homeright SteamMachine: Where to Purchase? Would you like to purchase this awesome steamer for your own home? As someone who has always been a big fan of Homeright’s steamers and their other products, I consider the SteamMachine a must for just about any household! Currently, you can purchase the Homeright SteamMachine on Amazon.com for only $149.99 with all of its amazing attachments! Want to learn more? Check out HomeRight on Social Media! Well, it might be more fun, but not lots of fun…. We had a Shark that did a similar thing but it broke recently. We haven’t replaced it yet so this one may be a better option. I wish we could get rid of all the carpet as well. it gets so dirty real quick with 4 kids. this steam machine looks amazing for quick cleaning! i hate to clean so anything that makes it easier for me is a plus. 4 kids means lots of messes. Our steam cleaner broke a few years ago & we haven’t bought a new one. But we really do need one. This looks nice, too, so I’ll take a look at it. I could really use one of these in my home, will definitely check it out. Thank you for sharing. This looks like a great vacuum. I love that it has all those attachments with it. I’d love one. My kitchen floors never look clean. Even after they’ve just been mopped. This machine looks really sturdy and I like that. I had a steam cleaner for years before it finally died. Then I bought Shark and it stopped working within months. I really like everything you said about it. We need something like this. I swear my nephews can make such a mess, lol. Just yesterday my Mom was saying she needs something like this. There are some great features with thi. I really like it leaves no residue, uses water instead of chemicals, and it is easy to transport. I would love to do my entire home with this! We are re-doing an older home and almost everything could use a real cleaning. I’ve used this type of machine on tile before, and it works miracles. It’s cool there’s a home version now. I love that this has attachments for cleaning more than just the floors. Cleaning the bathroom with this would be great. I can think of many uses for this in my home. I can’t believe how clean your sink was after using it. And without cleaning products…impressive and exciting! I have always wanted a steam cleaner. This would be perfect. I wonder how well this will work on mold. Our basement is covered with it and we have not been down there in two years! I know if I can’t breath, neither can they! I’ll be looking into getting one as soon as taxes come in. TY! Very welcome! Steam is fantastic at killing mold – I used one in the past to get rid of nastiness we found in our basement. I would just wear a mask, just in case, to make sure you don’t breath in the spores. I will let you know when I get one. I will have to write about my own experience. Your post and experience has me really won over. Thank you very much. I would never have thought to use it on the grill. This is a great idea. Also you could really clean the inside of your fridge! I’d love to be able to tear my carpet up except for in my bedrooms but I don’t have the money to replace anything yet. I have four dogs. I really need a carpet cleaner full-time. This looks terrific. I really like all the attachments and that you can use it on many different surfaces in your home. this looks so useful. I like that you can use it to clean so many rooms in so many ways. 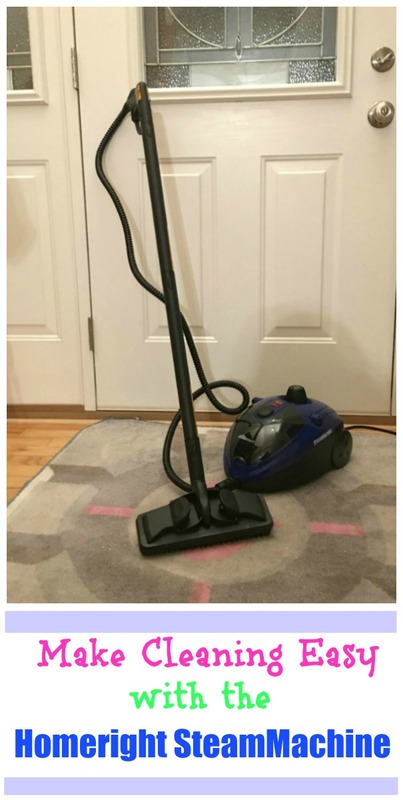 I NEVER HAD A STEAM CLEANER, NOW AFTER READING THE REVIEW I AM A FAN. ALL THE THINGS YOU COULD CLEAN WITH IT, I AM SOLD. I love how easy this is! It makes getting a good clean look like it’ll take a couple of minutes depending on what you’re cleaning. This is so wonderful! Amazing before and after pics. And you accomplished that with just steam! I love all of the attachments it comes with, too. I love cleaning with steam. I can think of so many areas of my home that I would use this on. This sounds odd but I think it would be fun to clean using this. I am so chemical sensitive, to the point of getting physically ill when I clean with them. I use vinegar and baking soda when I can. Steam would get things deep down clean. Thanks for the chance to win! We are geting ready to move into a new house and all of downstairs has hard wood floors so this would be perfect. I definitely like that it uses just water and not chemicals as i am allergic to most and that would be a lifesaver. I love that it disinfects and will get my home sparkling clean. I could really use this thing! I love that it can remove wallpaper, so cool! I really like the design of this steam machine. It looks like it wouldn’t get clogged with calcium deposits. Wow!! This is AMAZING!! I love how effective it it!! Holy cow!! And on so many surfaces!! I have been wanting a steam machine for some time. I like all the attachments! This is awesome! I am going to have to get one of these very soon. Thanks for sharing the info. I’ve heard of this company before, but I’ve never had the cleaning experience of using a steam cleaner. A machine like this would be great to have especially with my weakened immune system! I love that you can use to clean bacteria without chemicals on so many surfaces. I have switched to natural cleansers, but with this I would be able to save money on cleansers and still be cleaning without chemicals. 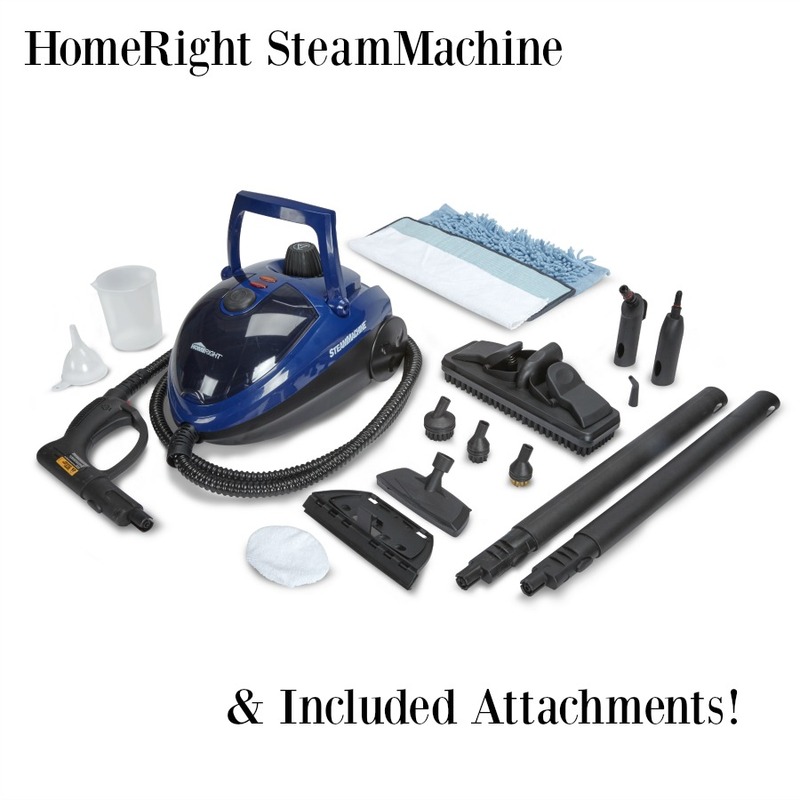 I love how portable & easy to use the Homeright SteamMachine is to use. I had a steam machine years ago & was very happy with it. This one looks to hold more water so it would steam a lot longer. What an awesome product to have when it comes to cleaning the bathrooms! Nothing beats steam for disinfecting & cleaning!! Wow, I have to say this thing looks pretty awesome! 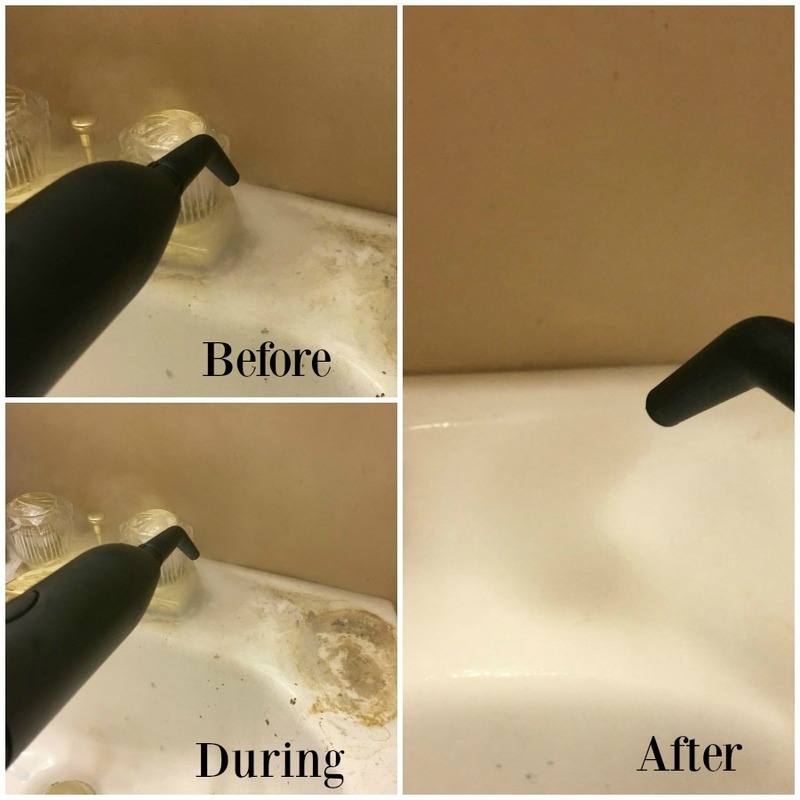 To see the difference in the before and after photo really proves how well and efficiently the steam cleaner works! Oh I would love to try one of these. It’s been on my wishlist for a long while. I’d be ashamed to list everywhere that I would need to use this. I KNOW the bathroom could use this! and we have an incontinent cat. (Enough said there!) I’m sure this would help behind the refrigerator, too. (How would this be on carpets?) I keep thinking about getting one! I did not realize how versatile and useful a steam machine is. Makes me think that I could really use one for most of my cleaning needs. I would love to have one of these. I can’t use chemicals due to health conditions so this would be perfect. My bathroom would be first! I am glad you were able to upgrade. I too with dogs in the household need to use a steamer on the carpet. I am sure there would be a lot of allergens. I like that it disinfects and how versitile it is. Go from cleaning the kitchen floor to countertops to even the stove. Gream amount of attachments and looks easy to use too. I love that it disinfects with water! I would love to have this steam machine. Great review! This steam machine looks perfect to do all my spring cleaning with. I would use it on my tile floors, my bathrooms (especially on the grout in floor tiles and wall tiles) and my stove top. I love that you don’t need harmful chemicals to clean. I love that it disinfects surfaces. This would work wonders on my toilet. I’ve never had a steam cleaner (other than one for carpeting only). I had no idea you could steam clean other things–and now I want one! Wow, that looks amazing. I would love to have such a powerful cleaning tool. I love that you don’t have to use as many nasty chemicals to clean. I have never owned a steam cleaner. This would be great for deep cleaning. I have been wanting one of these for years, but I just never could afford one. I love the fact that it uses just water, as I am sensitive to a lot of chemical smells. I love that it cleans virtually anything I would need to have done in way less time. What a great appliance to have in your arsenal. I always worry about using chemicals around the house to clean because of how unsafe they can be to the kids and pets. I love that this uses just water, is a powerful cleaner and sanitizes. This machine looks amazing. I love that it sanitizes without chemicals. I know it is safe to use around my kids and pets. There is a whole list of things I would love to use this on at our home! I’ll definitely take a look at this. I had the same after holiday cleaning blues and I think one of these would help! I SO need one of these for our tile flooring. I really like that it kills 99% of all germs and bacteria. That’s awesome! Looks like it could turn boring cleaning into a good time especially knowing that it would definitely clean what i needed it to! Wow! I love the versatility of this product. So many messes to clean..so little time! lol. I suppose this would do a great job and save me lots of time though! When I saw this I thought it would have just been for floors but I guess there’s so many ways to use it! I love how it kills germs and bacteria I have to have a germ free home as best as I can do to low immune system this is awesome no chemicals or strong smells . This would be so awesome! There are so many different surfaces in my home that could use a good, deep clean! First would be the stove and oven, then the linoleum flooring in my kitchen and bathroom hall way that has little divites in so you basically have to scrub on your hangs and knees to get it CLEAN CLEAN! Never used steam to clean much things before, I know it’s a great way to do so though! I like that you don’t have to use chemicals with this. The steam is enough to disinfect. I think cleaning the oven this way would be interesting. I’ve never tried to clean it this way. Perhaps it would be easier and more efficient. This seems like it would really help us. We have three pets and our house is in kind of a forested springs area. Our allergies are terrible, and it never seems like our vacuum and swifter get it all. What an amazing steamer..i love that this cleans and gets all the germs out of my house. Seems pretty easy..
We had a similar machine but different brand. It finally died and we would like another one. I will have to see if we can get this in our area or online. It looks like a good option for us. I really need this for my bird room, but would use it in my entire house. I love all the attachments that come with it. Wow, this looks like a great cleaning tool. I’m impressed. I like that the parts store in the machine, and that the whole thing isn’t that big, as I don’t have tons of storage space. Anything that keeps me from having to scrub things clean is good in my book and this looks exceptional in that regard. With five dogs, I could really use something like this to clean the kitchen floor and baseboards. This would probably make fast work of cleaning the refrigerator and freezer, too. We had a steam cleaner several years ago but it finally corroded bad enough that it wouldn’t work anymore. This one is much larger than the one we had and looks like it would work much better, hold a lot more water and produce more steam too. I would love to have one of these for cleaning around the house. I seriously need this steam machine! Per my moms ongologist we gave up all chemicals..leading cause of cancer along with fragrance in products. I struggle to keep everything disinfected in her home and mine..critical for hers through treatment. I’m thinking steam would help..with a lot less elbow grease that I’m doing now..and hours to do. This is definitely the tool I’ve been looking for. I love that it cleans so many different things, including grills! I hate cleaning the grill, so i don’t use it as much as I could. But with this, it would make cleaning the grill so much easier. I like that this steamer is so portable so that I can carry to the garage and clean it. In addition to the garage this will be perfect for all of our ceramic tile. Wow – that really took care of the soap buildup. I need this for the glass doors on our shower door. AND – to kill all the germs in my son’s bathroom. Oh how I covet that machine! Does it really work on the grill? I hadn’t thought of that. I have never heard of this machine. I would love this to clean my bathrooms. I have no carpets in my house so this would come in very handy!